I wonder why I remember some moments and not others. 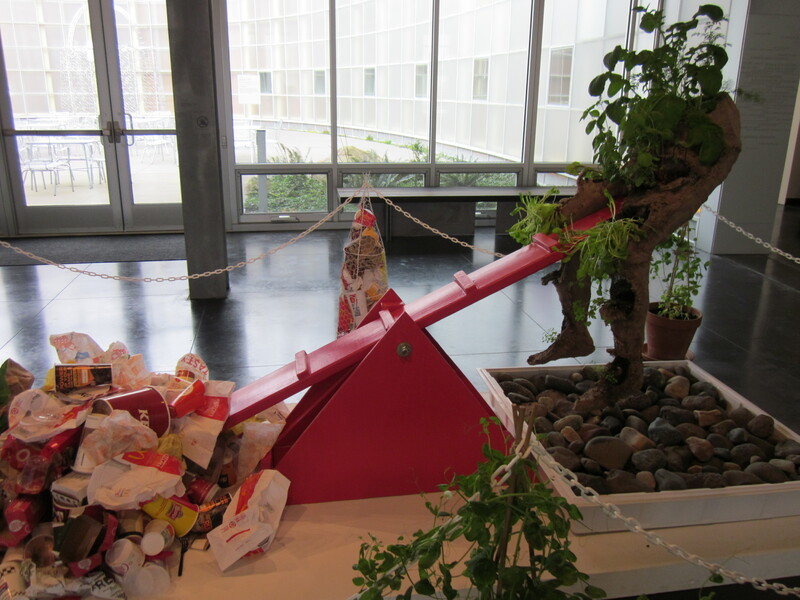 Obviously, going to Copenhagen made a big impression: without that trip, this blog wouldn’t exist. My memory stutters along, large gaps strung together with brief glimpses between like photographs, and short films that fade on either end into nothingness. I have taken my kids to parks more times than I can count, but I remember “going to the park” as the morning that my son, at less than two years old, wouldn’t sleep, so we walked over to play on the swings at 5am, and he sat on my lap on the big kid swings and laughed as the sun came up. 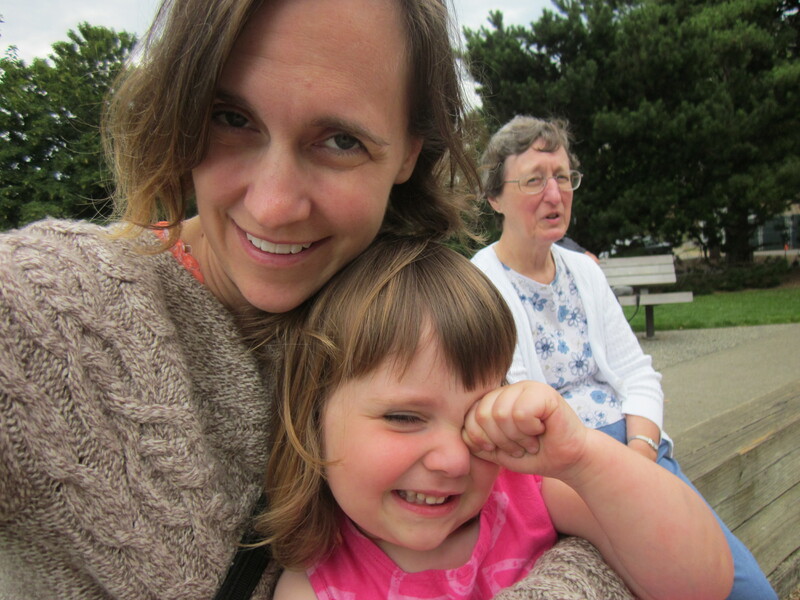 “Going to the park” is also the afternoon my daughter ran off, barefoot, in a crowd at Golden Gate Park, leaving me searching for over half an hour until another mom spotted me looking panicked and carrying her shoes, and came over to ask if I was looking for a little girl. She had wandered over to the carrousel and was on her 10th free ride. She’d told the operator she’d lost her mommy, which was true, although it hadn’t exactly been unintentional. I remember we had ridden the Brompton that day. I wonder why those particular events stuck in my memory rather than a hundred other times when my kids did more or less the same things. Why do I forget so much? The memories that are left take on the weight of all the other experiences I have forgotten, invested with more than they really contain. On reflection I think that they are times that I felt alive. I spend a lot of my time working in an office or sleeping. These things are not memorable because it feels as if nothing is happening. Time spent watching television blends into a slurry of sameness, and the driving parts of the road trips I’ve taken are largely, and happily, forgotten. I remember more of my bicycle commutes than I do of our old car commutes. I remember going to Disneyland as a child, but nothing of the drive there. The dark side of this forgetting is the expectation that the time drivers lose is truly forgettable, which turned out to be extremely untrue when one of them ran me down. I don’t know how to value the time that was lost, or the time that will be lost. Four months ago, I learned that a friend from childhood (a lifelong non-smoker) had been diagnosed with Stage 4 metastatic lung cancer. Now that I work in cancer prevention, I know that there are cancers that are unlikely to kill you (endometrial, skin), and cancers that are likely to kill you pretty soon (liver, pancreas). And then there is lung cancer, probably the only cancer that can make people wish they’d been diagnosed with liver cancer instead. With an old friend, the memories crowd each other even with all the things that I’ve forgotten. We were lab partners in high school chemistry, a subject in which she excelled and in which I definitely did not excel. She showed me how to see the phosphorescence in the bay, we drew cartoons of the ridiculous books we read, and we dated the same boy, sequentially and cheerfully. During summers in college I would come home after long bike rides to read emails she’d written from Costa Rica or Madagascar, and there are bits of knowledge I carry even now from them, like that countries that were once French colonies have less wildlife than their neighbors because the French ate everything. When we sailed in the afternoons in Birch Bay the water was so shallow that the sun baked it all afternoon until the bay became the world’s largest hot tub. In graduate school we hiked through the Berkeley Hills and shopped at the Davis farmers’ market. 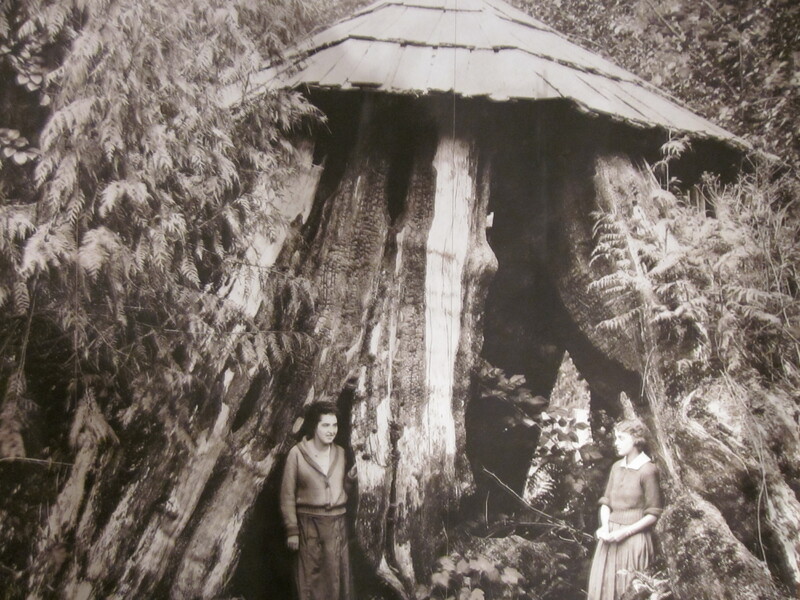 I visited her in Bodega Bay during the summer that she had to haul buckets of water every day to save the patches of wild strawberries that she studied for her dissertation. When she became a postdoc in the UK I learned that American PhDs were worth more than European doctorates, which turned out to be useful knowledge when I lived in France. She and her husband visited when my children were born, bringing fruit and cheese and crackers before I was even ready to leave the house. 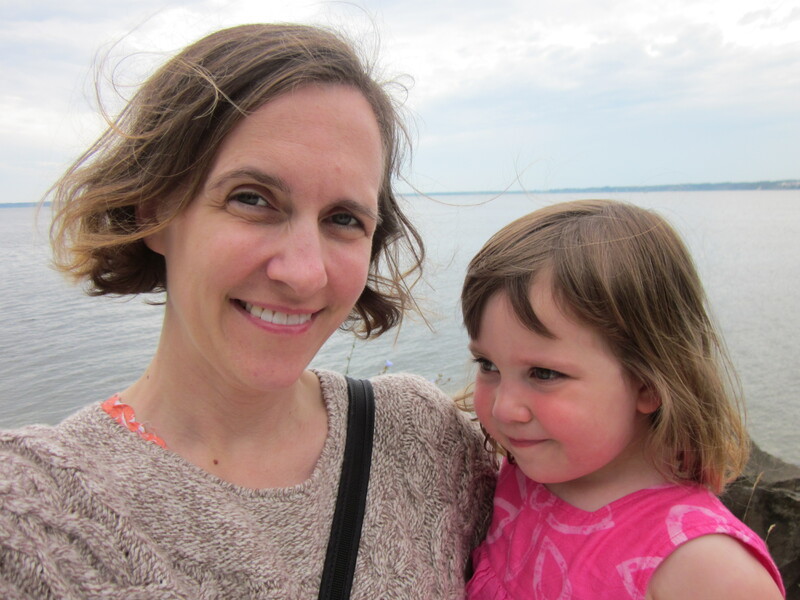 Her work changed over time, to tracking the viruses used in bioterrorism, so every few years the FBI would call me with more questions about our past as her security clearance grew more rarified. And so I remember more than I would otherwise, more than I could write about or share. But it never seemed to matter when I remembered and what I forgot, because there was always more time. Until suddenly, there wasn’t. Even with so many memories there are some that return, again and again. I remember one summer afternoon, when we met at the park by the bay. I rode my bike, the red Nishiki 10-speed mixte that I rode everywhere then, and she rode hers. I locked up while she did aerial cartwheels on the grass. 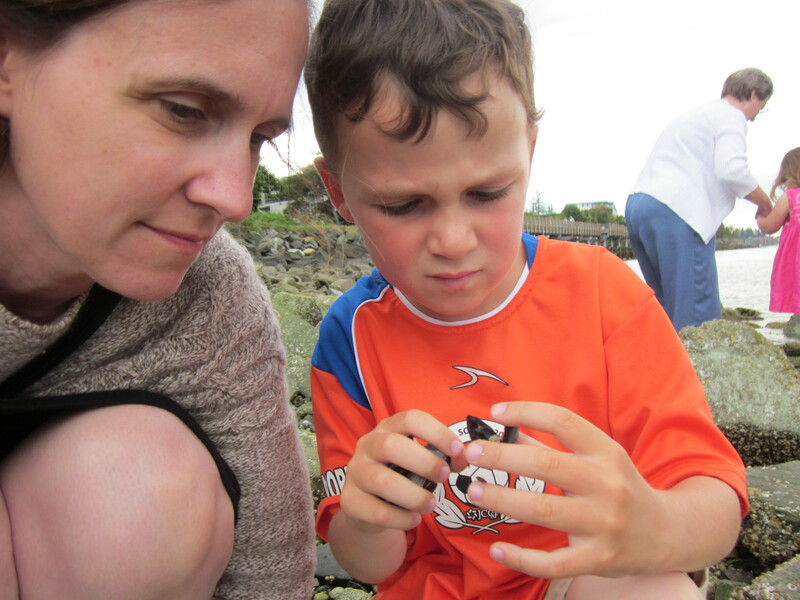 We walked to the beach and looked through the tide pools, dissected some of the dead wildlife, and considered checking out the body of a seal. We decided against it because we hadn’t brought gloves and it was starting to smell. We talked about everything and nothing. What makes that memorable? Why does my mind keep returning to that afternoon? My red bike. A green cable lock. The fractal edge of a rocky beach. The sun in the sky. How does one memory hold so much weight? She says she is not afraid to die. I wish I remembered everything. 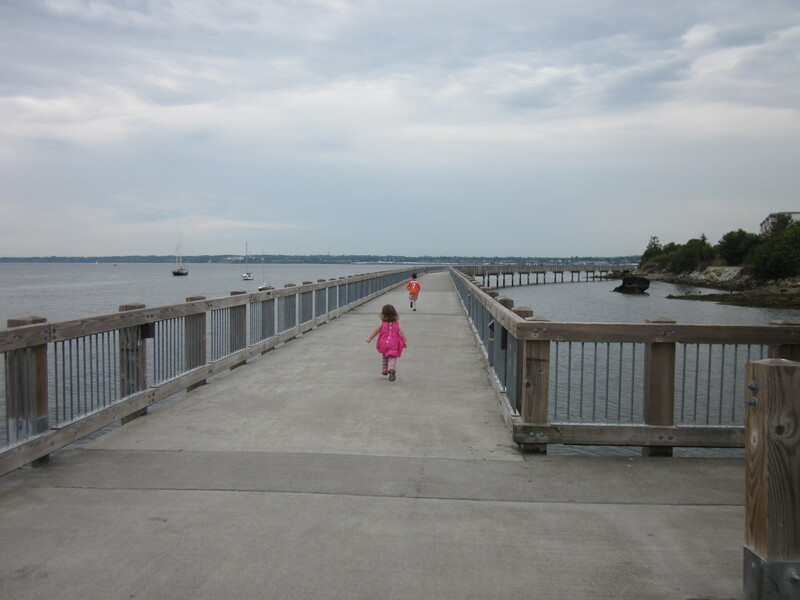 We visited Bellingham, Washington, where I grew up, last August. It has changed dramatically since my childhood. I think it is at least twice as large as it used to be, just for starters. Although there was always a university there in my memory, it has grown larger too—what used to be gravel parking lots for commuter students have been taken over by campus buildings, and the student population now lives there year round. 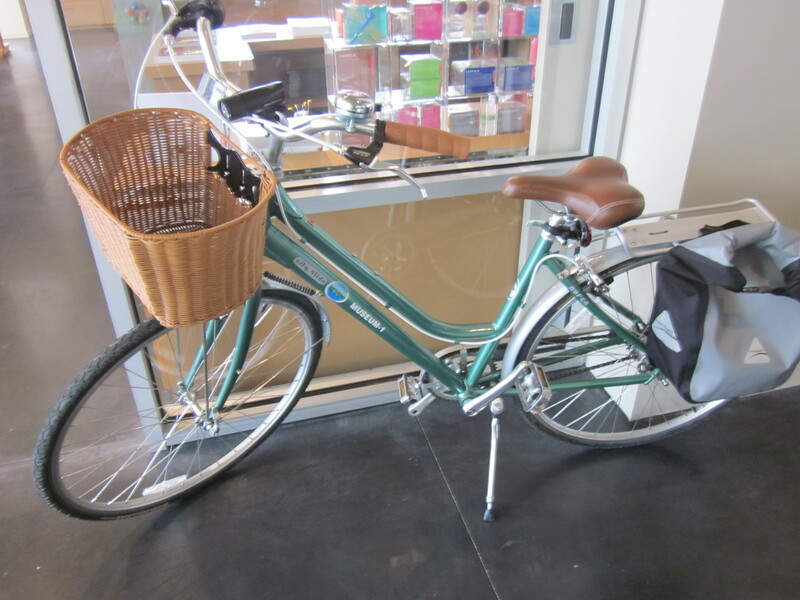 The German bakery in Bellingham used this bike for deliveries. They imported it from Germany, where postal workers use them. I rode my bike as a child in Bellingham, often for transportation, and as in many small towns at the time, this wasn’t considered unusual. Our parents didn’t consider driving us around to be part of their responsibilities, and the city buses were irregular, so it was ride or walk, and we did both. This was well before the time that kids were supposed to wear helmets, so none of us ever did. We also didn’t lock our bikes, because there wasn’t any bike theft. And I never had lights on my bike either, because there was a curfew and kids weren’t allowed out after dark. This lone wolf was riding in the bike lanes. 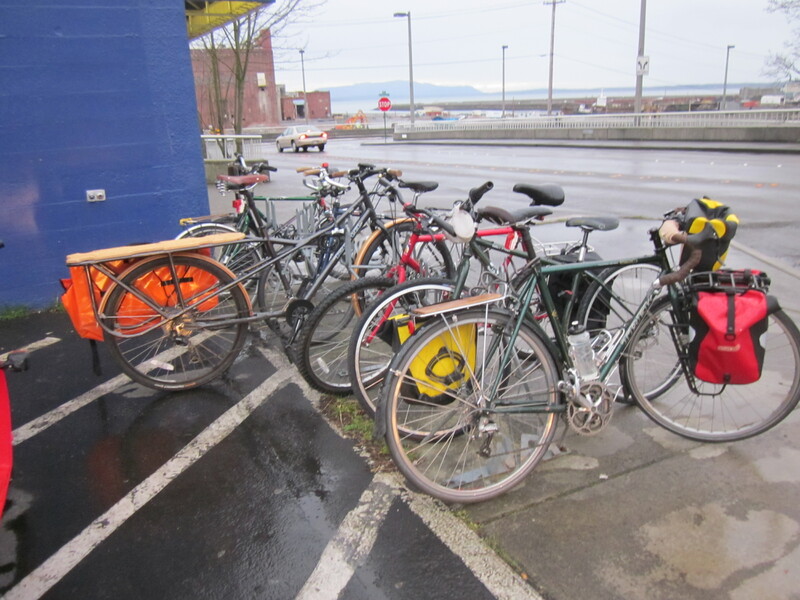 When we rented bikes in Bellingham last summer I could not believe how much had changed. I rode on streets as a child because that was what was available, and the streets were mostly quiet. 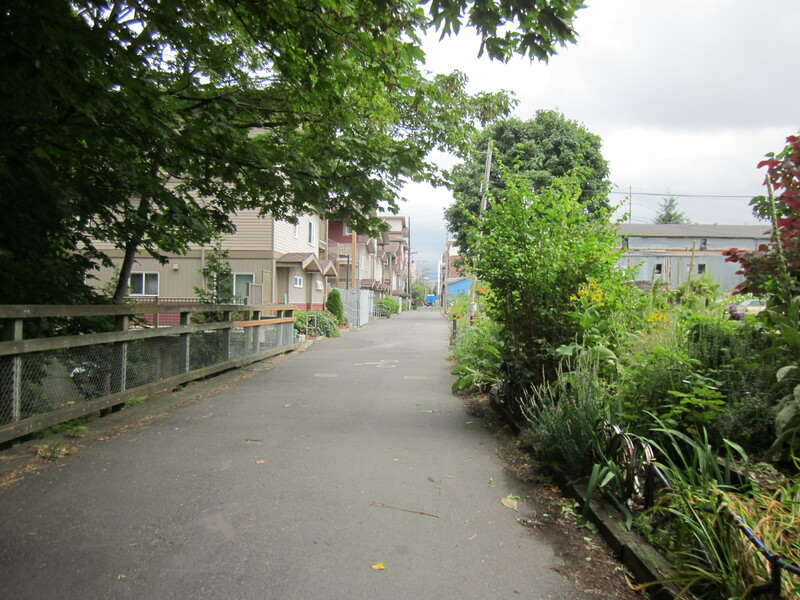 On larger and busier streets that connected neighborhoods, there were bike lanes. I rode on those too. The greenway markers tell you how to get from here to there. 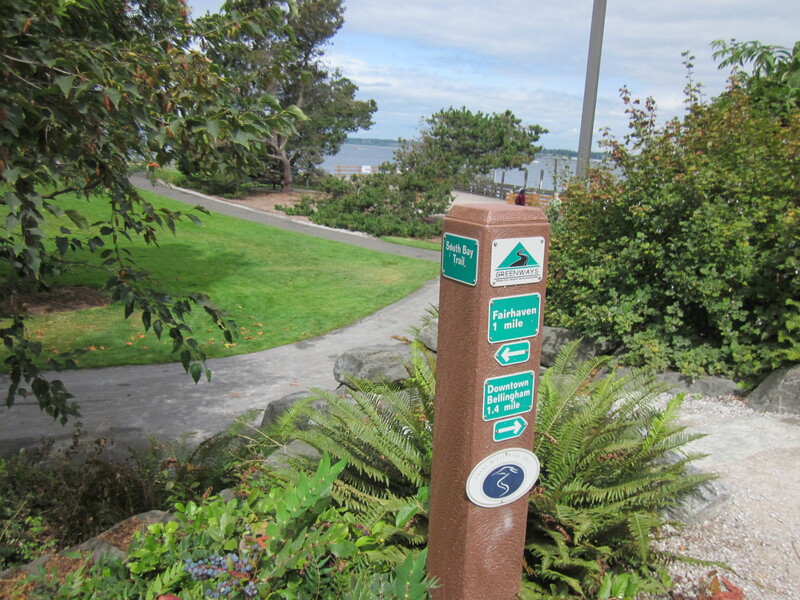 Now there is no need for many of those bike lanes, because in the time I have been away, the city of Bellingham has built greenways that are completely separated from the streets. Even though they don’t cover the whole city, they go almost everywhere I wanted to be. The city has a fair number of hills, but none of them are very steep, and the extensive infrastructure meant that bike commuters were visible everywhere. 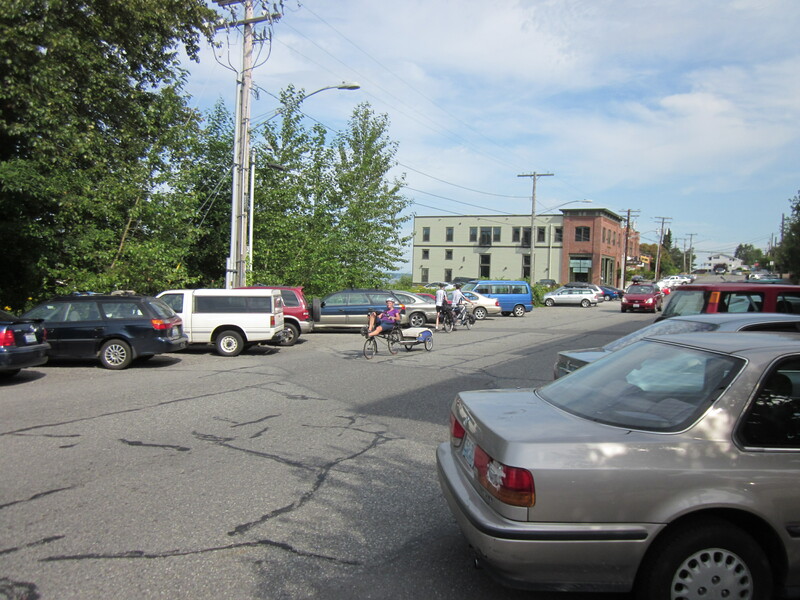 Riding the greenways, and the quiet streets, I realized that people in Bellingham have no reason whatsoever to own a car (although almost all of them do). There are paths and bike lanes to take people nearly everywhere in the main part of town with minimal exposure to cars. 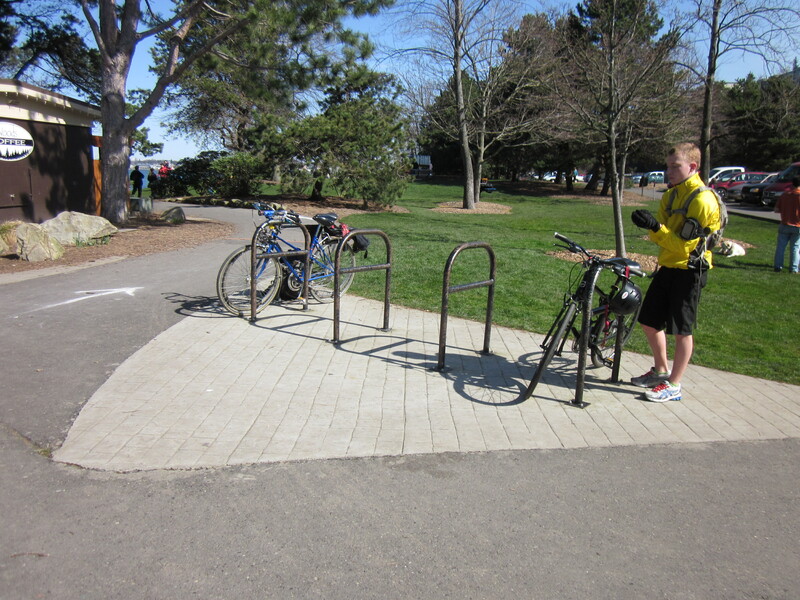 There is always bike parking at your destination. Most of the interesting places to shop and visit are on dedicated pedestrian plazas—cars no, bike corrals yes. Admittedly many stores are a few blocks from the greenways, and it’s often necessary to ride on streets briefly, and of course my perspective on what constitutes serious traffic may be somewhat skewed. It still impressed me. What interested me most was how many stores, restaurants and housing developments were oriented toward the bicycle and pedestrian greenways instead of the streets where cars were allowed. 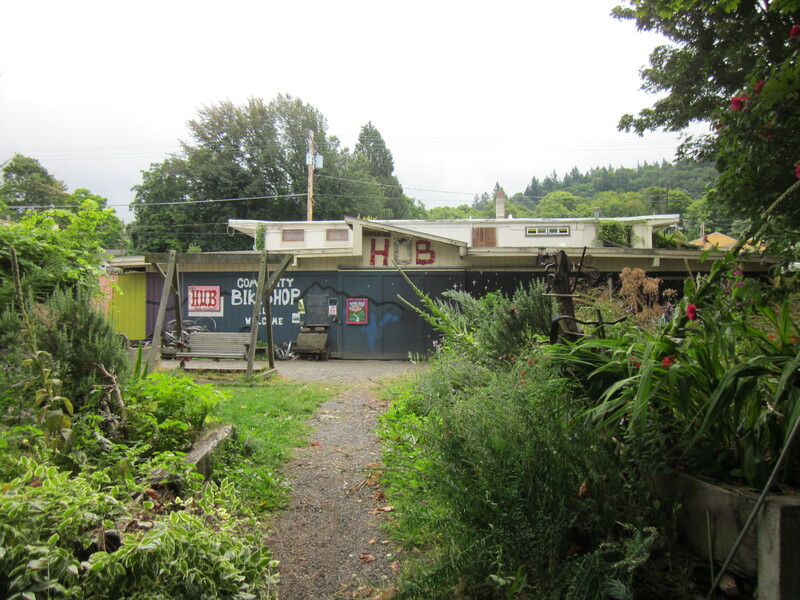 As we rode closer to downtown, parallel to streets we had driven on earlier in the week, I realized that what I had thought were abandoned buildings or warehouses were instead a community bike shop, a strip of small restaurants and bars, and a bakery. Opposite them were condo buildings that opened onto the greenway from walking plazas. This the return route from downtown; the bay is to the right. Bellingham does not lack for natural beauty. It runs in a narrow strip between the water and the mountains. The greenways run along the water and through woods, and the buildings that pop up along the trail seem tucked into a world without roads. Even in terrible weather (and the weather was often terrible during our stay, either hot and muggy or cold and raining) riding those greenways felt like stepping into the Shire. This part of the city can only be seen from the bike path. 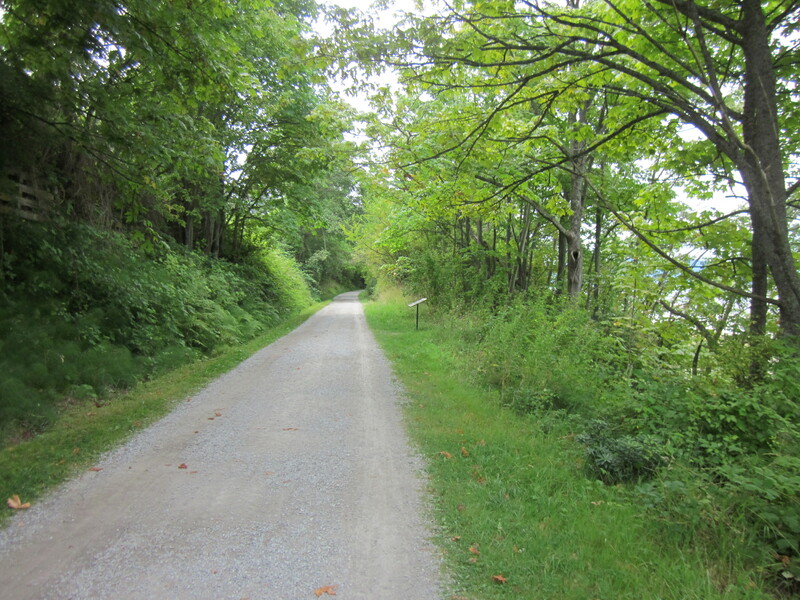 Riding in Bellingham felt very bucolic, although it’s not perfect. From a car, it seems like many other small cities, even though there are a lot of bikes on the roads. There are strip malls and wide roads with speeding cars, and far too many crosswalks with lights too short to allow anyone to get across without sprinting. Yet when we got on the rental bikes I realized that there was a smaller second city built in parallel, inaccessible to cars and human-scaled. 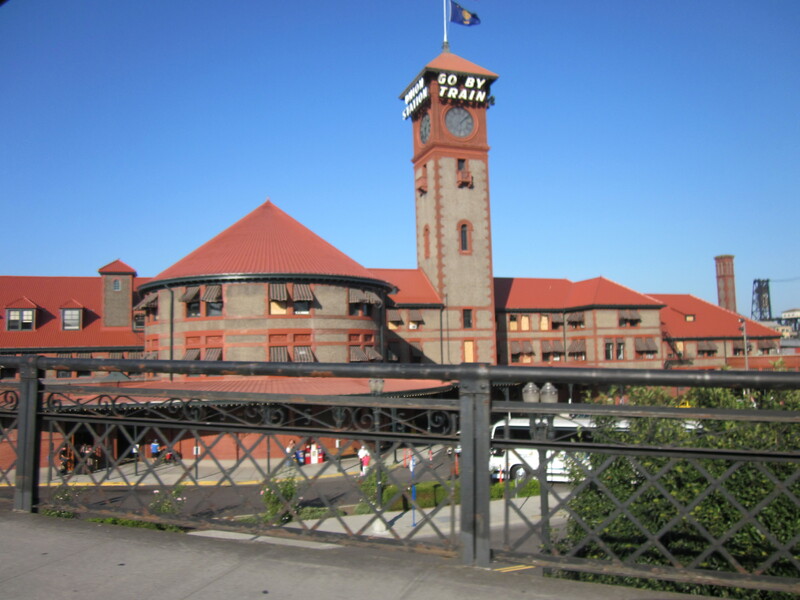 I have always visited Bellingham because my mom lives there, and had little other interest in the city. But now I have another reason to visit. I want to figure out how to export their infrastructure back to San Francisco. Surprise! 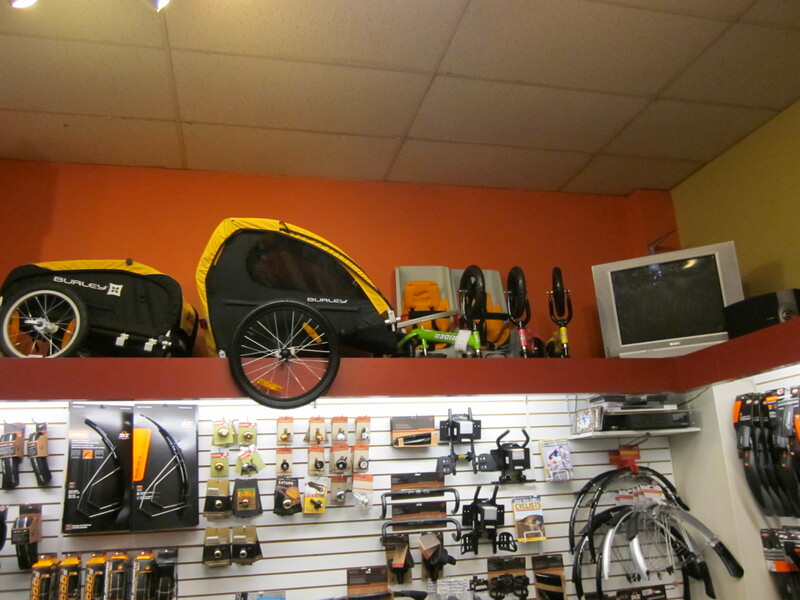 We visited a bike shop in Bellingham! Unbelievable, right? 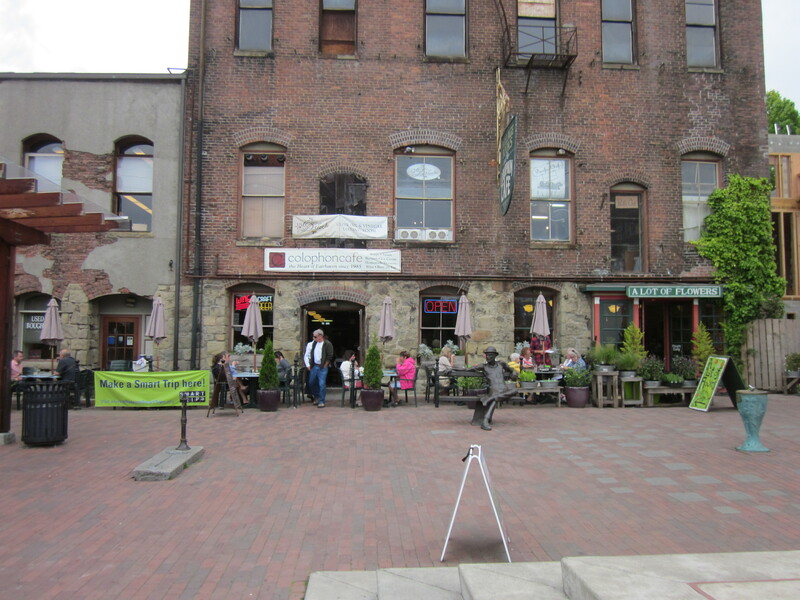 There are places in Bellingham that I recognize and places I don’t. It’s been about 20 years since I lived there, and like anywhere else it changes. From my jaded urban perspective many of these changes are improvements; it is possible, for example, to get a decent meal in a restaurant, if you aim squarely at the paper-napkin-but-the-heavy-kind level. With this target firmly in mind we headed one evening to a brewpub. We were not the only people who had this idea, it turned out, and the place was packed; even if the only patrons had been riders of the bicycles parked in front, they wouldn’t have been able to seat us. So they gave us a beeper and told us we could go anywhere within four blocks for the next hour. 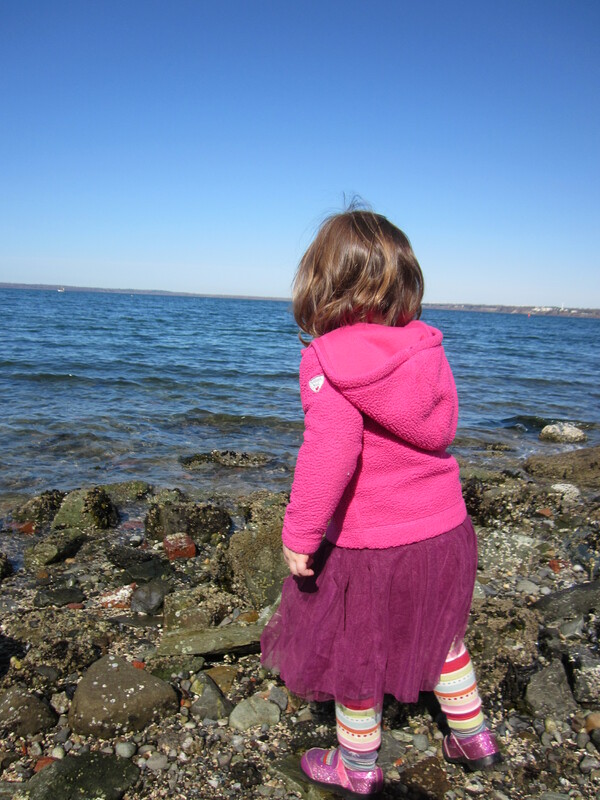 We took the kids outside because they were being raucous. 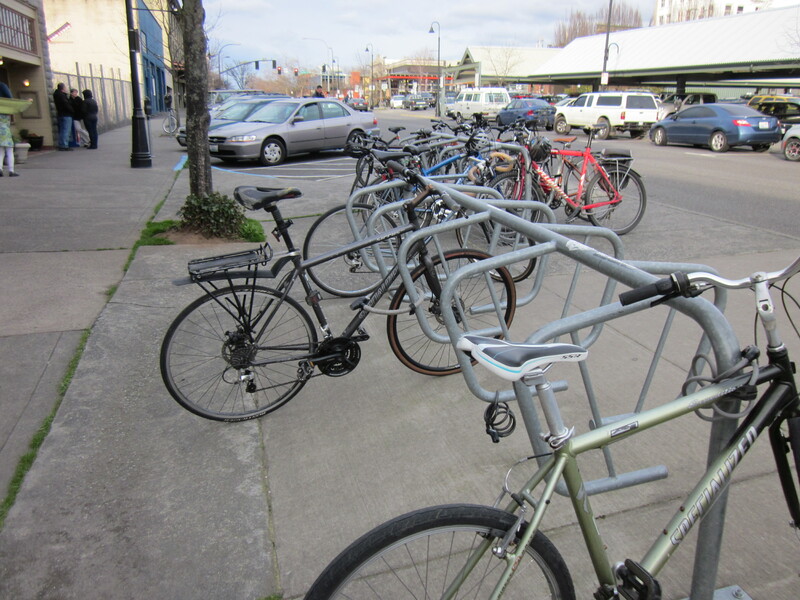 It was the best decision we could have made, because a block away was Kulshan Cycles. This is only 1/3 of the store. 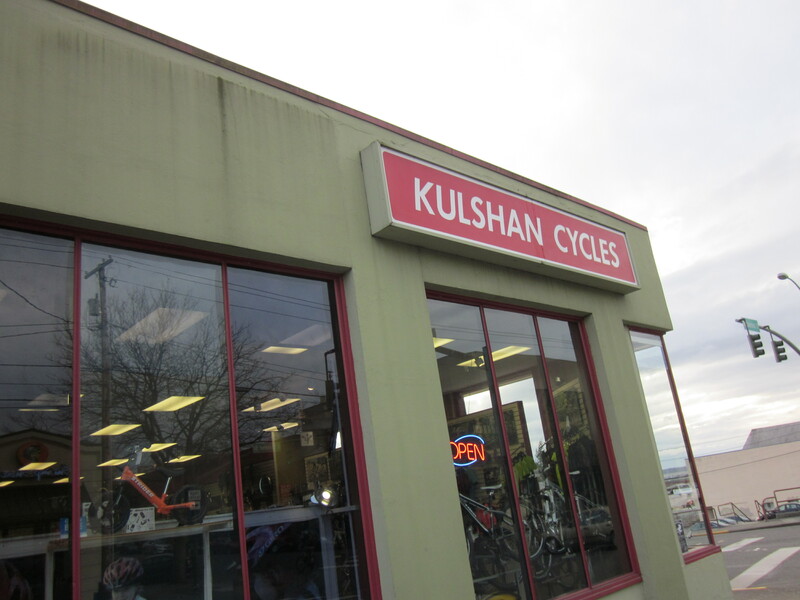 Kulshan Cycles was a store that I did recognize. 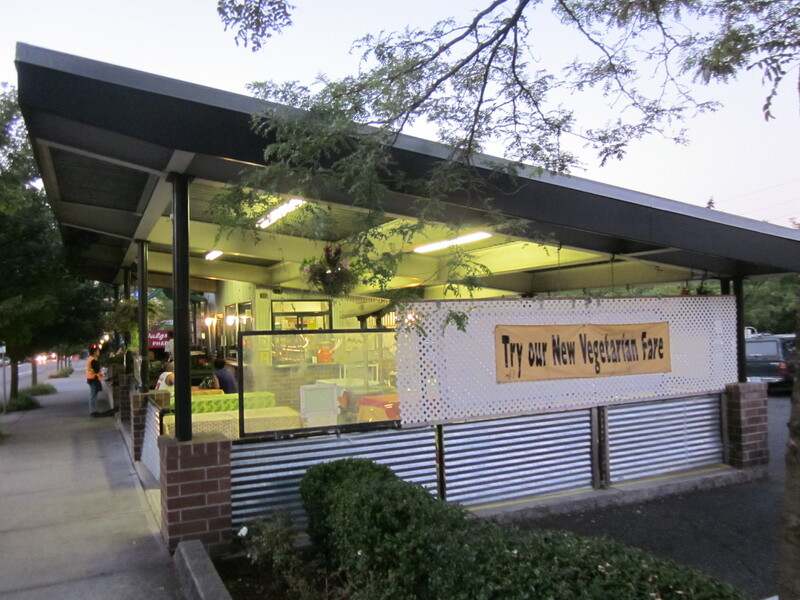 It turns out they’ve been in business in the same location for 37 years, longer than my family has lived in Bellingham. I had a vague memory of going in once before, but whatever I remember pales in comparison to reality. It was in some ways the strangest bike shop I’ve ever visited. A display like this is always a good sign. In San Francisco, bike shops specialize. There is a shop that sells only folding bikes, and a shop that only does repairs, a couple that sell only electric bikes, and about a bazillion that specialize in either mountain bikes or fixies. 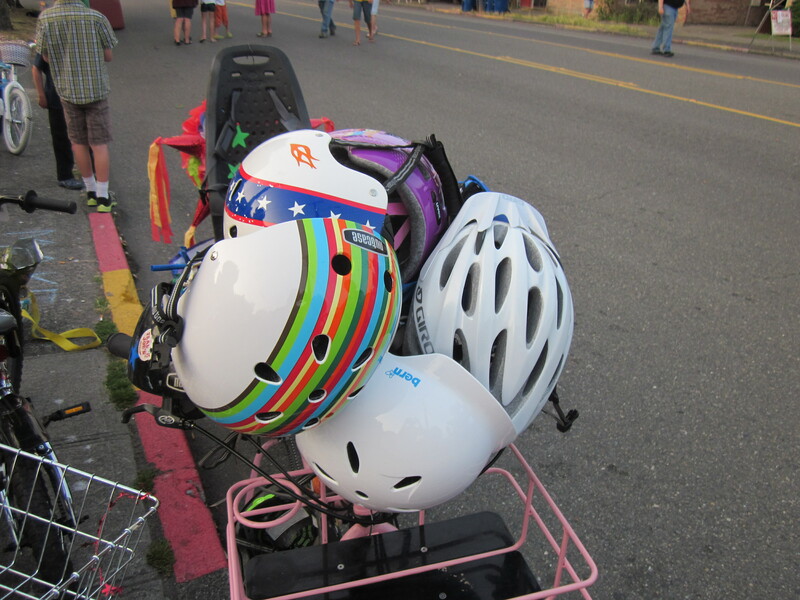 Bellingham is not big enough to have specialty bike stores. Instead, it has Kulshan, which does absolutely everything. I know just enough about bikes now that I was blown away by the diversity. We had to drag them off these bikes, literally. 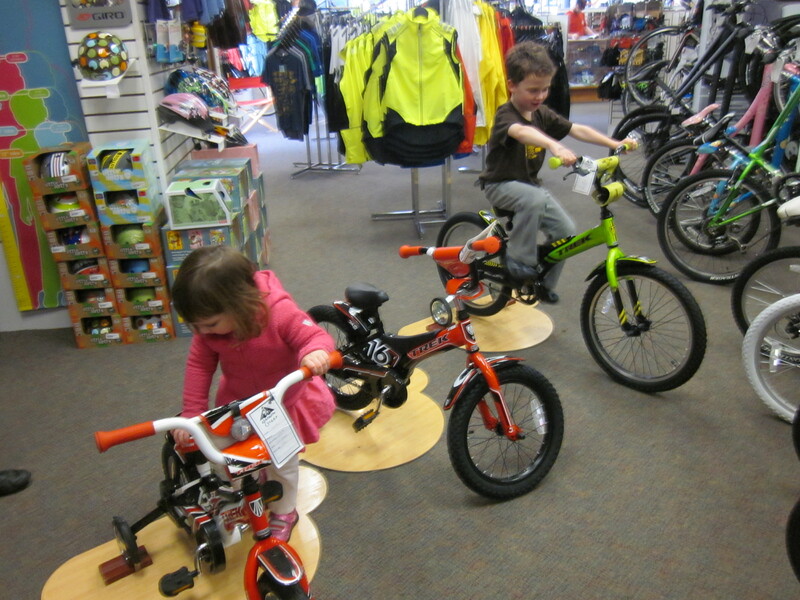 My kids ran to the kids’ bike section. 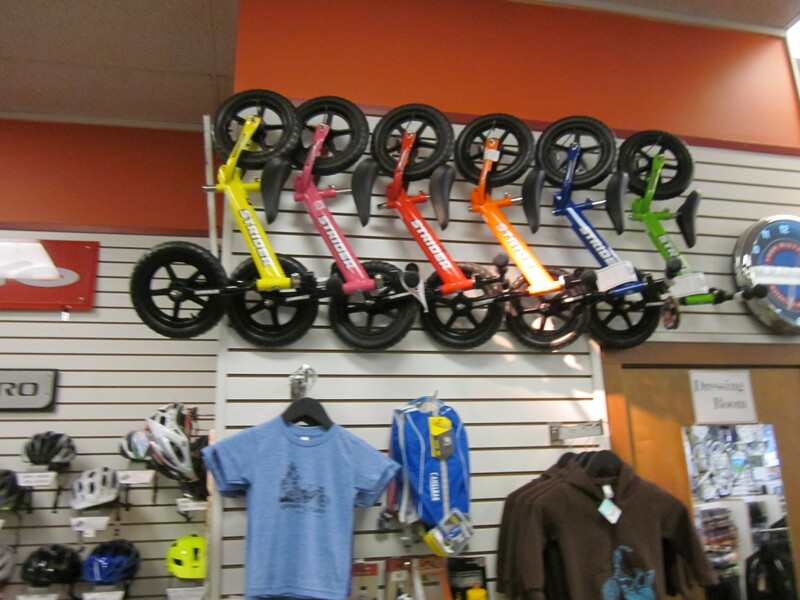 The display bikes in various sizes made the only practical use of training wheels I’ve ever seen—the store had attached them to boards so that kids could use them like stationary bikes. Mine spun on those bikes for about 40 minutes, and it was very easy to see which bike fit each kid. In the meantime I walked around their enormous store, increasingly impressed. This Brompton featured my high school colors. Nice touch. 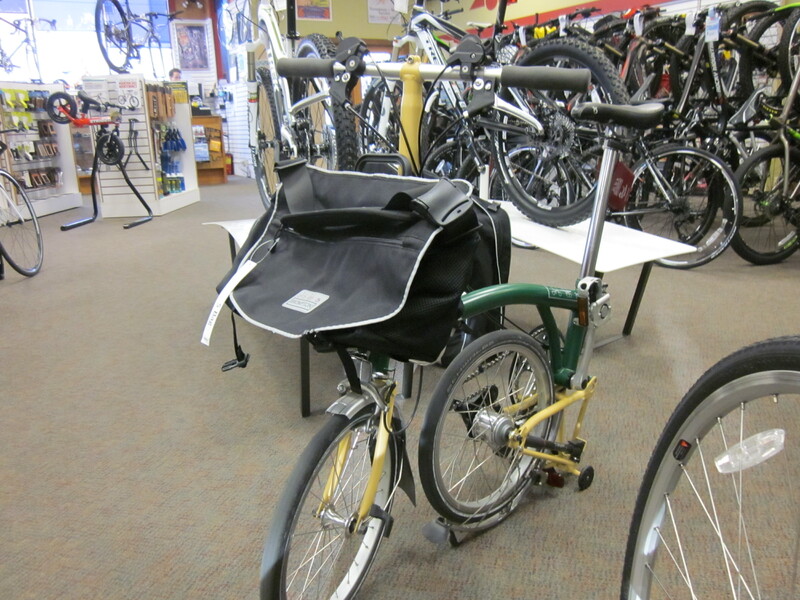 They sell Bromptons, and had a display Brompton that I could practice folding and unfolding. 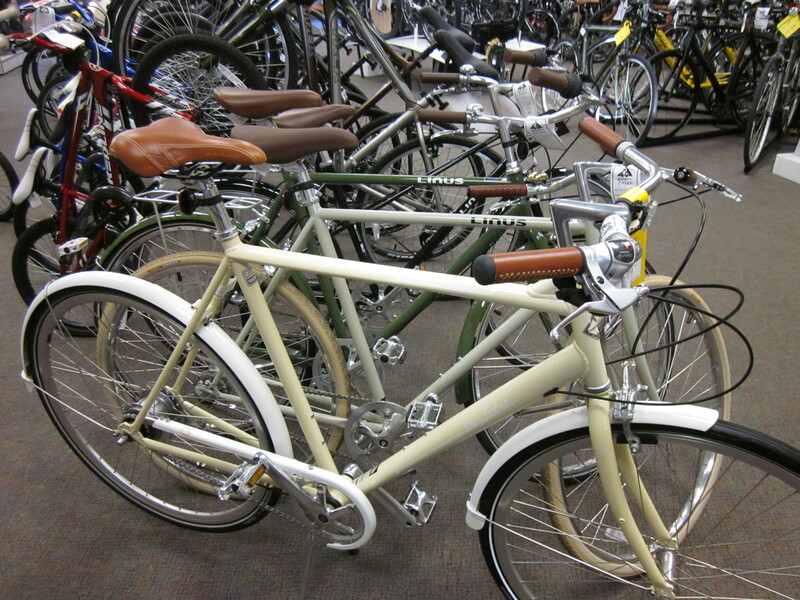 And speaking of the UK, they sell Pashleys, which I had only ever heard of before, as heavy 3-speed English bicycles are about as practical as Hummers in San Francisco. 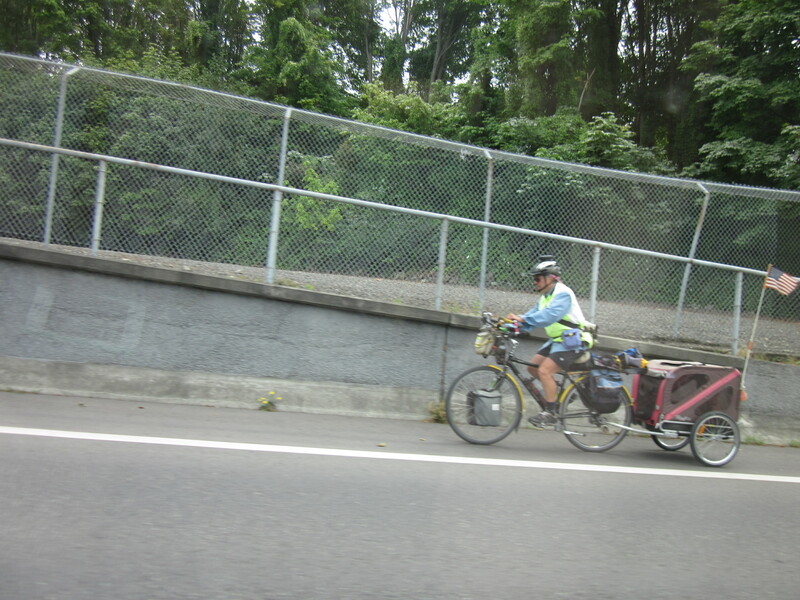 They’re not very practical in Bellingham either, which is hilly, but they had one just in case. 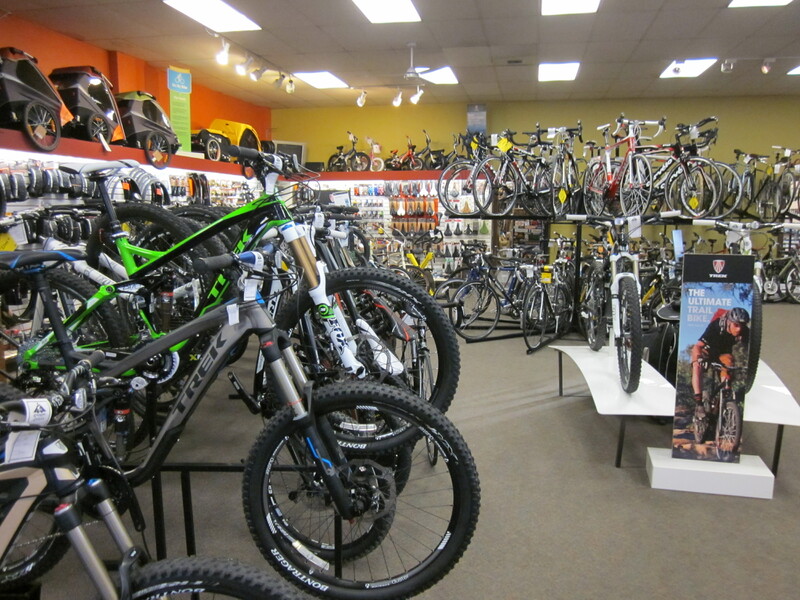 They sell mountain bikes. They sell commuter bikes, and nice ones at that. And they sell many cargo bikes! 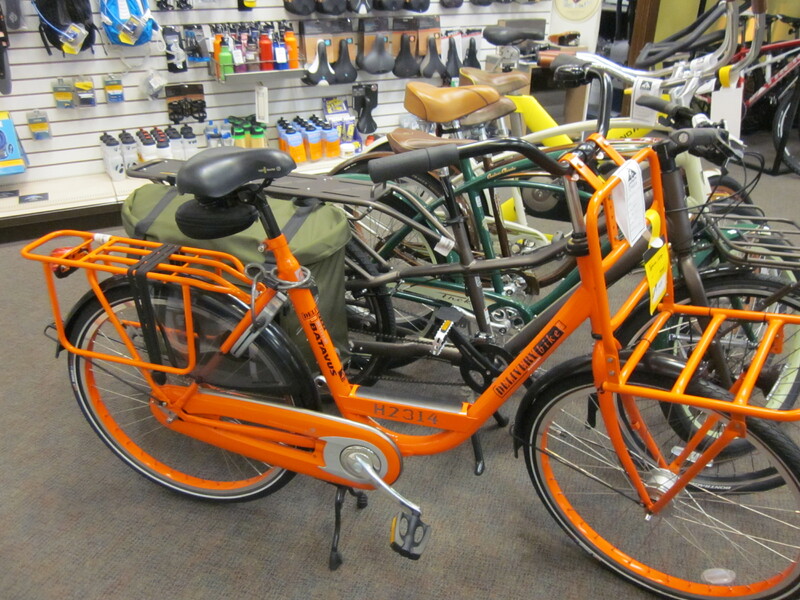 An orange Batavus Personal Delivery, which I knew listed at over $1000 (later I checked: list is $1300) was on sale for $750! It’s also not a good climber, which perhaps explains the screaming deal. But if you are in the market for a Bat, I’m guessing that even with shipping it would be tough to beat this price. They had a Trek Transport, which I’d never seen in person before. They had nearly every Surly under the sun in stock, but had recently sold their Big Dummy. At this point I had started talking to the guys on the floor. One of them told me he had built his own Xtracycle-type bike the year before the FreeRadical came out, and had put a child seat for his son on it. 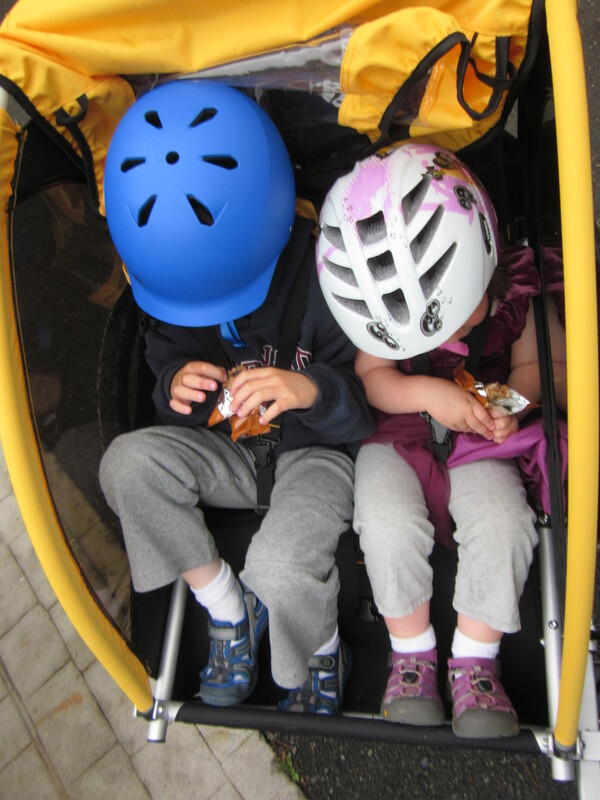 Then he showed me the child seats they sold; a rack-mounted seat even cheaper than the Topeak (which I now think of as the finger-slicer). They stocked that particular seat because that was what had sold historically, but had ordered and installed Yepp seats for customers recently. 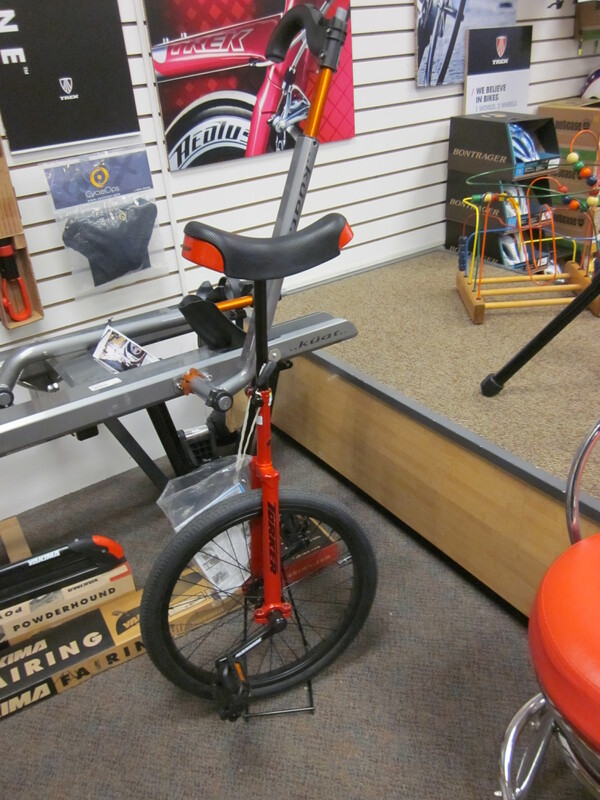 Unicycles: are they more or less practical than fixies? Discuss. I told them I was blown away by the selection. “Oh, have you seen our overpriced fixies?” they laughed, pulling out a bike painted the same flat black color as cars that speed on country roads late at night with their headlights off. I know nothing about fixies except that they have no gears and that in San Francisco they are primarily ridden by people who hate children, but evidently this one was an exemplar of the genre, as it cost $3000. And this was at a bike shop willing to sell a Bat for almost half-off. In San Francisco I presume it would sell for $5000. When I told them I was visiting from San Francisco, they asked if I had an electric assist on my cargo bike. Because it turns out that they also sell electric assists, primarily the BionX, and given the local topography, that market has been growing. They had a loaner Trek with a BionX in the back that they let customers use for a few days if they were thinking about electric bikes, and did I want to borrow it? It was very tempting, but that bike didn’t have child seats, and they’d need a day to put them on, and we didn’t have another day. Would they rent it to me on a future visit? They were willing to consider it. Will I be calling them to try to rent a bike the next time I’m headed to Bellingham? You bet. But if that doesn’t come through, it turns out that there are other shops that rent bikes in town: Fairhaven Bike & Ski (which is the same vintage as Kulshan, and also offers rental trailers), Jack’s Bicycles, and Fanatik, none of which I visited but all of which I will check out if necessary, because the next time we visit Bellingham, we’ll be rolling on two wheels. My son wanted the Sumo wrestler horn. I told him he already had a horn. In the meantime, Kulshan has unicycles. They have beach cruisers. 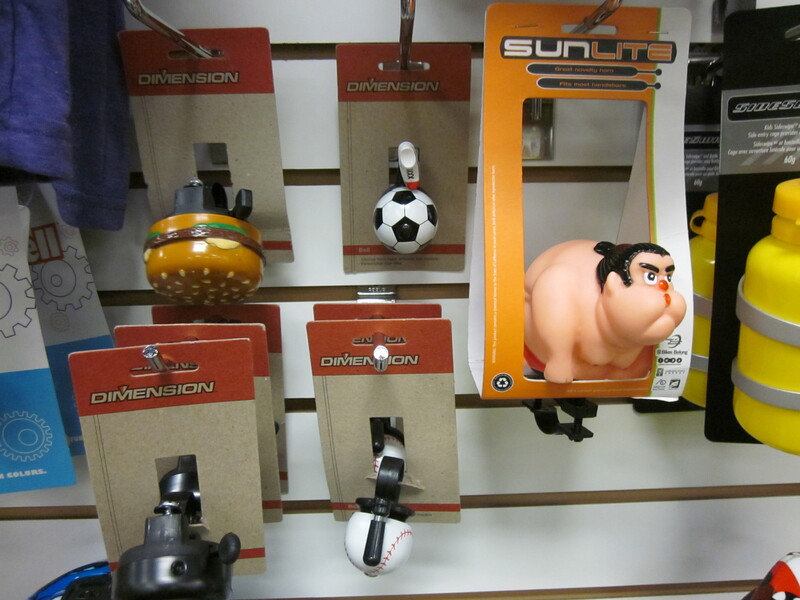 They have Sumo bike horns. They have multiple child trailers, which make sense to use outside of major cities. They have t-shirts with bike-friendly messages in sizes down to infant. 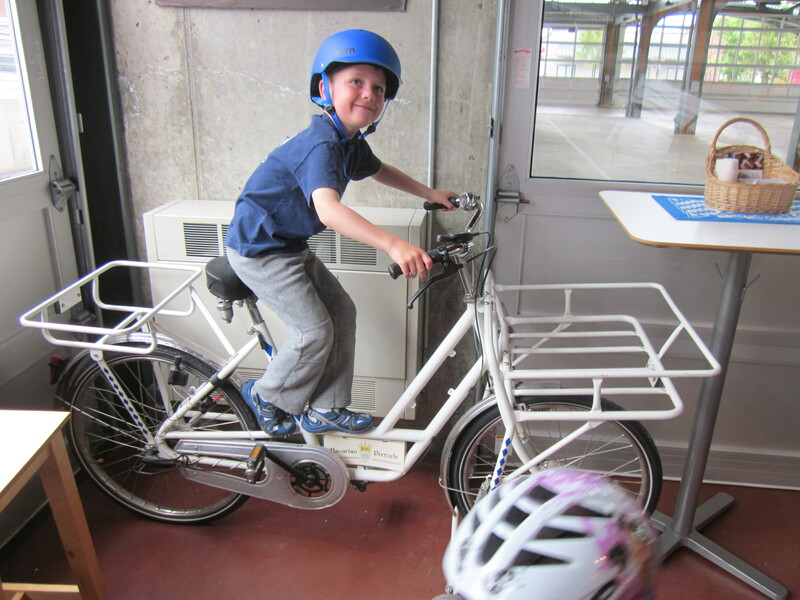 They had a balance bike displayed on a repair stand, and that made me laugh. The employees were clever and friendly and funny and happy to see kids in the store. 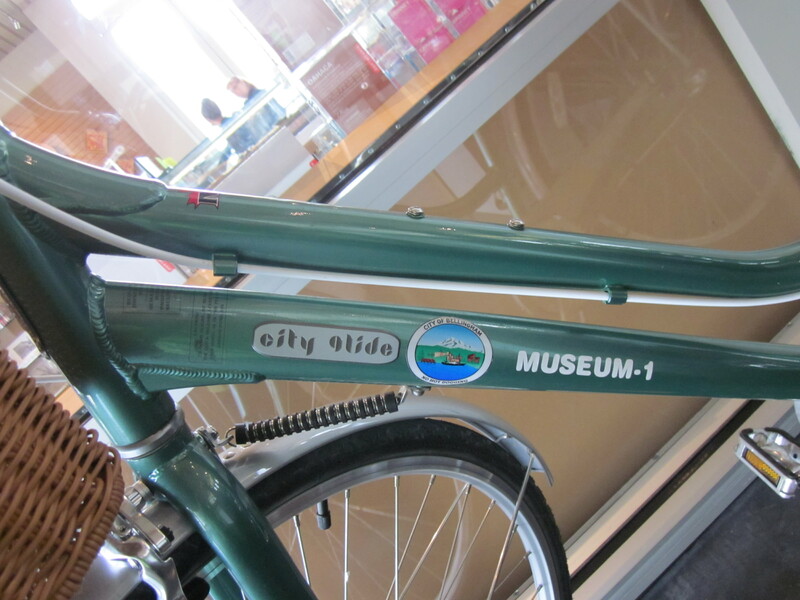 I liked Kulshan Cycles. Not every small city has a bike shop like this, but all of them should.